Looking for a special place to kiss this Valentine’s Day? From romantic statues to bridges and even a cemetery, here are five places to kiss this Valentine’s Day. And if you don’t have anyone you want to kiss, these places work just fine for selfies. Photographer Alfred Eisenstaedt immortalized the kiss that celebrated the end of World War II in Times Square when he captured it in his iconic black and white photo. Now that kiss is a giant sculpture towering over San Diego’s idyllic waterfront. The 20-foot bronze sculpture designed by Steward Johnson has been dubbed “Unconditional Surrender” and it stands next to the USS Midway Ship turned museum. The statue is also known as the “Victory Kiss.” Getting a kiss here is definitely a score. Built in 1691, the Gamle Bybro (Old Town Bridge) is also called the “Portal of Happiness,” making it a popular spot for marriage proposals. This bridge of happiness is certainly a good place for a kiss—or a selfie. After you get that kiss, head across the bridge to Trondheim’s “Old Town” – Bakklandet. With its cobblestone streets lined with carefully preserved small 17th century houses transformed into cafes and galleries, Bakklandet is a treat. Don’t miss the popular café, Baklandet Skydsstation, where owner Girli Riis Holmen personally greets every patron and serves up pickled herring along with other Norwegian delights. You might want to get that kiss before you eat the pickled herring unless you’ve brought your breath mints along. Located along the Miraflores coast overlooking rugged coastal cliffs, the Parque del Amor (Love Park) is a favorite destination for all types of lovers. There are quirky mosaic sea walls, colorful flowerbeds, towering palm trees and Victor Delfin’s famous sculpture "El Beso" (The Kiss). Appropriately unveiled on Valentine’s Day in 1993, the sculpture depicts Delfin and his wife locked in a passionate kiss. Newlyweds head to the statue to seal their marriage with a kiss. And each year on Valentine’s Day, the statue is the backdrop for a kissing contest where couples compete to see who can maintain the longest kiss. Who can forget the covered bridges in the heart strings-pulling movie Bridges of Madison County? Nicknamed, “Kissing Bridges,” romantics believe covered bridges exist for the sole purpose of stealing a kiss. The practical minded folks say they were built to resemble barns so farm animals would feel more at home and not stampede as they were driven across rushing waters. But kissing is definitely more romantic. You can find these historic covered bridges scattered throughout the USA, but if you want to reenact the Meryl Streep and Clint Eastwood romance, Madison County, Iowa is the place to go. 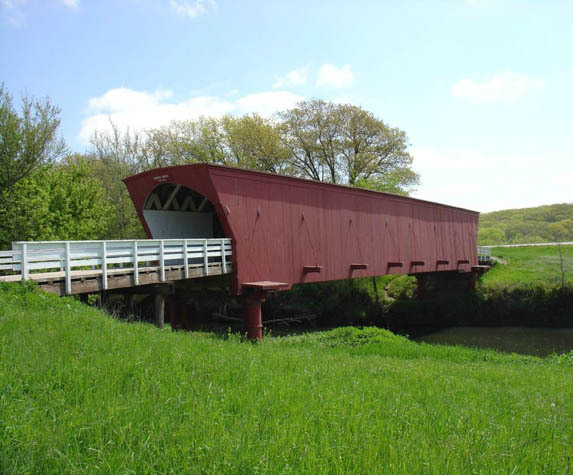 As the Covered Bridge Capital of Iowa, Madison County has the largest group of covered bridges that exists in one area in the western half of the Mississippi Valley. If you don’t have anyone to kiss this Valentine’s Day, head to Père Lachaise Cemetery in Paris and kiss Oscar Wilde’s tomb. The author and poet’s legions of fans have covered his tomb with kisses over the years. Oscar Wilde once wrote, "A kiss may ruin a human life." Apparently it can also ruin the stonework of a tomb so in 2011, the tomb was cleaned and a seven-foot high glass wall was erected around it. Now his fans leave kisses on the glass. Get yourself a tube of bright red lipstick and leave your mark. Do you have a favorite spot for kissing (or selfies) around the world?